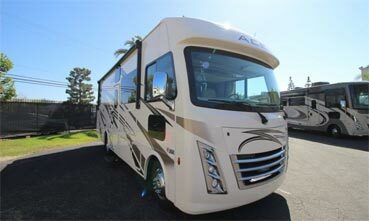 New American Motorhomes and RVs for sale. Used Rvs from the UKs only VOSA approved MOT centre. Full wall and double slide out floor plans are available. 6 Floorplans to Choose From. Luxury diesel pusher with double bathroom and bunk floor plans available. Welcome to the Synergy® the Diesel Mercedes Motorhome that is made to Fit. 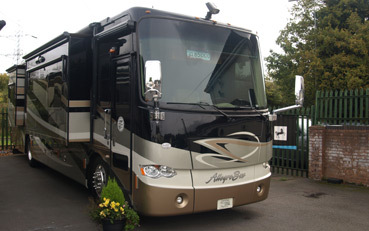 Search through one of the largest range of new American Motorhomes and RV’s within the UK. All vehicles come with extensive factory backed warranty and are to IVA & UK specification. We are Blackhorse approved dealers with numerous finance options available. Search through one of the largest selections of Quality Pre-Owned American Motorhomes and RV’s in the UK. 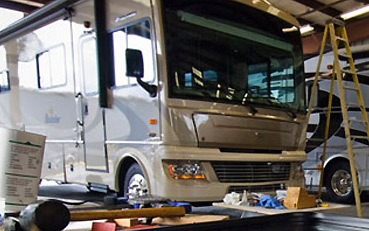 Signature RV offers a range of custom made services to ensure your RV stays in perfect condition. Our maintenance packages maximize your vehicles life and reduce the chance of breakdowns. Situated at the heart of the UK, Signature RV is a stones throw away from Birmingham International Airport and close to rural county of Shropshire, based on the well know Westcroft American Motorhomes site, on Cannock Road, between Cannock and Wolverhampton. We offer both new and used american motorhomes & RV’s for sale. Buy with confidence from the most trusted name in the RV industry with over 27 years of experience in buying , selling and servicing RVs in the UK & Europe. Signature RV are the only importer trusted by the industry`s leading finance company Blackhorse with exclusive rates and fully FCA approved 667127. We are the only RV dealer that is fully approved by the National Caravan Council with approved workshops.